Drake's was one of the first menswear brands that really inspired me, back in the days when I'd sit in Michael Drake's study going through old decorative art books, dissecting patterns. Drake's managed to combine craft and style, deep tradition and wearable modernity, in a way that is still rare. It is a very personal honour therefore, as this site approaches its 10-year anniversary, to have my name alongside Drake's. Perhaps it is best thought of as a styling, though, rather than a collaboration. It comprises a full outfit - jacket, trousers, shirt, tie and handkerchief - where I've selected one of my favourite materials for each, creating a look that I love, and is rather different to the classic Drake's aesthetic. 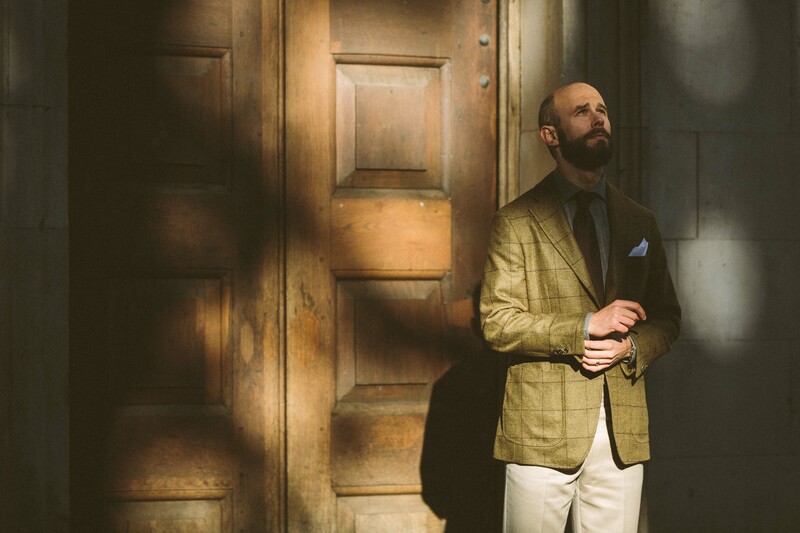 The outfit was based on these lovely photographs Luke Carby took of me at Pitti a couple of years ago. Back then I commented that I liked the sombre green of that Escorial cloth - with its faint purple checks - and the slightly urban look of the grey brushed-cotton shirt. It's not office-formal, nor country-casual, but something in between. For the RTW version we went to Escorial again for the cloth, making it up in the Drake's three-roll-two style with patch pockets and self-lining in the front. The shirt is in a similar brushed cotton, with a spread collar. And rather than copy the original knitted-silk tie, I went for a brown small-knot grenadine - just because I love the 9cm-wide version of this from Drake's so much. I wear the navy version constantly. That tie also has a small tweak I'm fond of: no keeper. Because a tie flows so much better without tucking in the back blade. For the trousers, we selected a putty-coloured cavalry twill, which again is made up in Drake's standard style. I've been wearing cavalry twill so much since writing about it back in March, and this colour is the most versatile of the lot. Pale and muted enough to go with any jacket (save mid- to light grey). The handkerchief is not unusual, being a white 100% linen, hand-rolled. But it is my favourite. 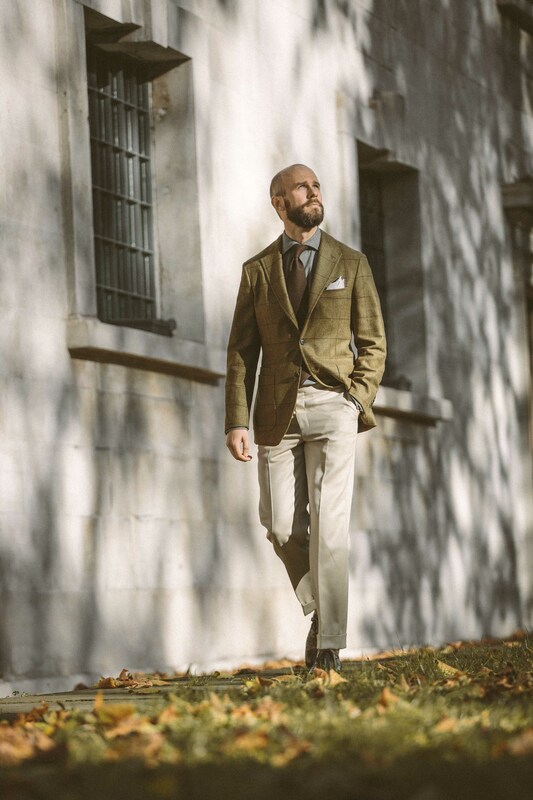 One thing that is nice about the jacket design is that the lack of lining (and self-lining in the front) emphasises the natural stretch of Escorial wool. I wrote about its crimp-based fine-merino properties on that original post, but you do feel it far more in this jacket than in my bespoke one, because there is no lining getting in the way. Although readers have suggested it in the past, I've never wanted to design tailoring - primarily because so many other people do it so well. However, it is nice to do something like this with Drake's, where I can pick cloths and as a result have the jacket and trousers available to anyone buying RTW or MTO. These couple of months are always the biggest for menswear. Compressed by the factory summer shutdowns at one end and Christmas sales at the other, it feels like almost a year of sales are squashed into a few weeks. That's certainly been the case with my collaborations (sorry everyone), and it is with events too. But if you can make it down to the event this Wednesday, please do. It's at the Drake's Clifford Street store, from 6pm-8pm. Drake's will also have their new range of made-to-order swatches to browse. 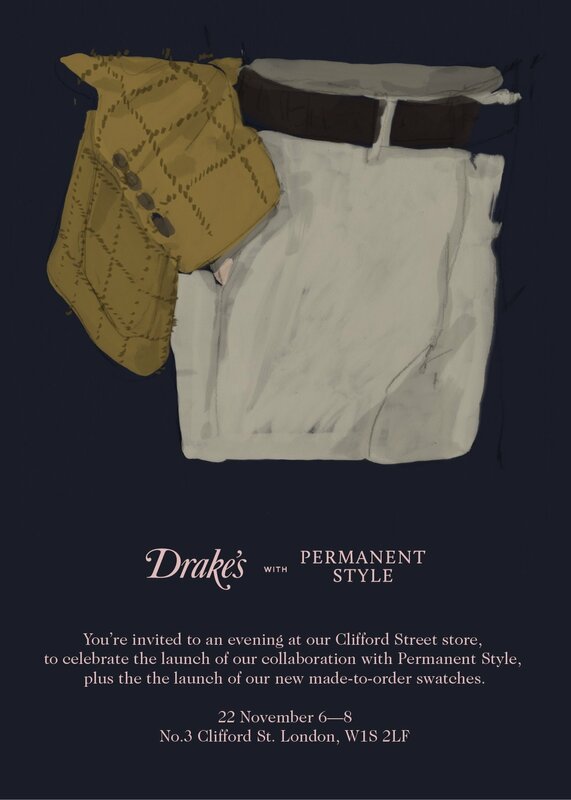 You can follow the discussion on The Drake’s x Permanent Style outfit by entering your email address in the box below. You will then receive an email every time a new comment is added. These will also contain a link to a page where you can stop the alerts, and remove all of your related data from the site. Can you please ask Drake’s to do more 9cm ties that are not longer length. A nice ensemble, Simon. And good to see you working with Drake’s. It’s not a question of that Johnny, but whether it’s available as cut lengths, for tailors. Mills only offer some cloth this way, as they have to support it with stock and sell in small quantities. A lot is only available for bulk order, for RTW manufacture. Dear Simon, I like cavalry twill, too, but I would like to know why YOU like it, and if you would object to indigo cavalry twill? – where would one tuck it? If you don’t tuck it, where is it? Thanks Peter. Please read my original post on cavalry twill for detail on why I like it (link in the post). But I would probably not wear indigo, no. The back blade can be tucked into the ‘keeper’ on the back of the front blade – the strip of fabric sewn horizontally there. I prefer not to do this as it stops both blades from falling naturally. 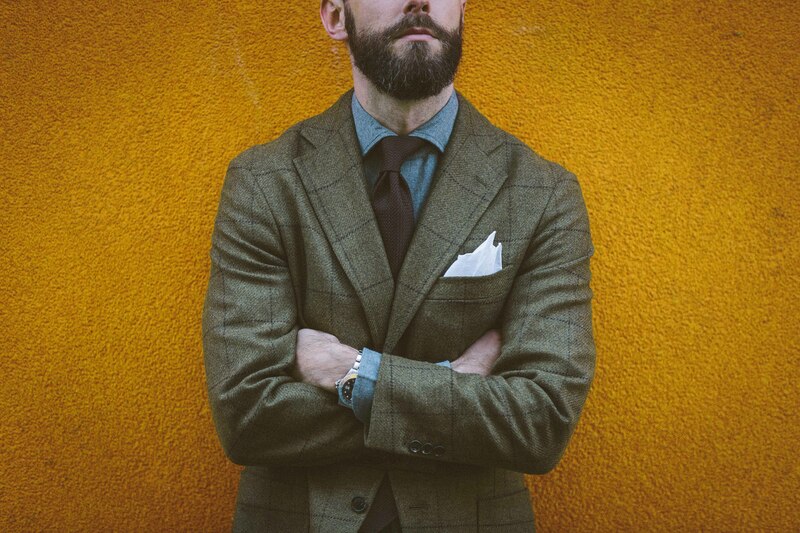 Is there any chance that readers could be allowed to purchase the jacket and trouser cloth separately to be made into bespoke pieces as with the denim for the shirt? Not through Drake’s, no. I’ll check the availability of both from the mills themselves though. I would also be interested in whether the jacket cloth is available. Hey Simon I would be interested a length of the Escorial cloth for a bespoke commission as well (opposed to the drakes version). They are a little shorter than a classic length, but still longer than most on the market. 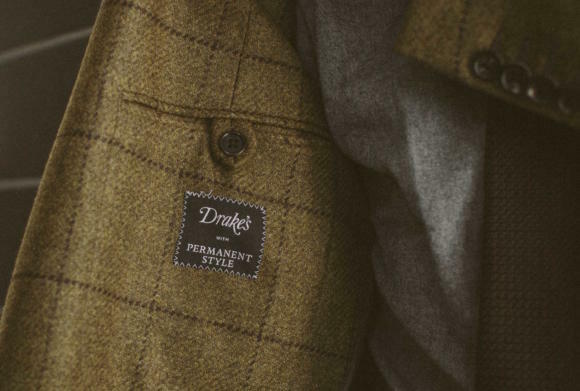 The thing that has always stopped me buying jackets from Drakes is the height of the gorge/notch on the lapel. I know that’s the trend now, but I wish they would lower it a little to give slightly more classic proportions. This jacket seems to have the same problem, though perhaps the MTO process would solve that. Thanks. I don’t know for sure, but I think it’s unlikely MTO would allow changing the height of the notch. Sorry but this is another one you have got wrong. I haven’t worn a shirt that color since I was at school, and with this outfit it looks meh. Pale blue with burgundy or bottle green tie, ecru with rust or lavender tie, white with navy or pink tie, pink with navy or lime tie…………..but not gray. While you are making some elaborated suggestions, which I am thankful for, I’m surprised that you have not found out yet that there is no such thing as “getting it wrong”, as there is no right or wrong, because everyone has a different taste. It might be worth noting that the things are available on drakes website. Just bought a few pieces. Maybe update the post with the links? Unfortunately, they are not yet available on the US site. Perhaps an oversight? those prices quoted are for RTW Simon? What’s your more general opinion of Drake’s mto program? This is truly a great initiative! This is a very “chic” outfit! And it reminds me of two previous posts. Interestingly enough, in the first it was already about you and Michael Drake musing over different senses of style! To me this type of outfit is possibly the most cosmopolitan of all in today’s world. And yet, it happens to be also the most exacting to put together! Since a good amount of knowledge is always required to get it right, while implying a certain amount of playfulness from the wearer. Live the shirt. Is the grey brushed cotton available for bespoke? I believe so, yes, it’s a grey Canclini cotton that I wrote about a while back. See here. Beautiful items – congrats on the collaboration Simon. I just went online to grab the jacket in a 42, but it’s showing sold out already! Any idea if I can get one? Is there more stock coming? Wow, didn’t see that. I’ll check with Drake’s now. David, apparently there is stock still in the Drake’s shop on Clifford Street (the two are different from a stock point of view – online and in the shop). Perhaps worth phoning them up there. No, not at all. It just happens that all of the collaborations come in during these few weeks of the year. After one more there’s nothing planned for about four months! Have you read my post on where I plan to take these collaborations? Interested to hear your thoughts. It’s here. Recently you wrote that the PS collaborations are not part of a general expansion into retail. Personally I’m not sure that this isn’t a faster step in the same undesirable direction: encouraging enthusiasts to dress well through imitation. Do you mean, encouraging people to copy bespoke commissions by buying ready-to-wear versions? Or, to buy things that I’m wearing? If the latter, then this has surely been going on for a very long time. Why should encouraging enthusiasts to dress well by imitation be undesirable? Anybody familiar with education knows copycat is a necessary stage, anybody familiar with formal logic knows the elementary importance of partial identity (or another expression: “alike”). Thank you very much for all the great work you have been doing for almost ten years now! May I suggest you could write in the forthcoming times a a comprehensive, step-by-step book on “Permanent Style : Dressing for a (more) casual era?”. It could address the topics of Formal Wear and Casual Wear. lt could also expand some of your original concepts (the scale of formality and its steps for instance). That would be really great ! I’ve got to say, Simon, that I love you (personally), and I love your work. You have probably answered about 20 of my sartorial questions over the past few years: and I’m talking about my own selfish posts to figure out whether something is a good idea, how to care for a specific garment, or how to store something. My understanding is that you answer each post, personally (when you do answer – which has been always, for me), you take other peoples’ views into account, you write negative (honest) reviews when you don’t like something about a tailor, a process, or a product, and you allow negative posters to have their say. I really like that you’ve curated some things for us to consider. I have to admit, these things are often too expensive for me personally. I like REALLY GOOD bargains, and unbelievably high quality garments. I like paying $200 for a $5000 jacket (which I often do), and you couldn’t possibly offer those kinds of discounts to your readers – it just wouldn’t be cost-effective – the raw materials cost more than that. My point is that you are using your platform for good: the people who read this blog are into “permanent style” – clothing and accessories that will hold up, and that are beautifully made. Sometimes you offer these products to your readers – curated in a way that cuts through all the clutter of high-street marketers, and the hundreds and thousands of boutique shops around North America and Europe. In other words – we’re Dante and you’re Virgil, and I – for one – appreciate the tour. Thanks Wes, that’s really nice to hear. I’m pleased you like the personal replies too. It’s something I’ve always liked doing – even when it does take an hour in the morning! Very nice and I love the jacket. I’m curious how tall you are. Forgot to add a few things. Will be looking for the jacket if it comes to the US site. Also wanted to get your thoughts on their cordurory jackets and pairing them with denim as opposed to the matching trousers. Oh, and noticed your piece on the D-43. If I didn’t already have so many Barbours and Cabourns… Anyway, nice piece and I agree. Should one hang them in a closet or fold them like knitwear as recommended by Luca Faloni on his website? Also, do you find that cashmere jackets shrink over time? Nearly $2700 USD for Belvest off the rack jacket is absolute madness; purchasers are sycophants. 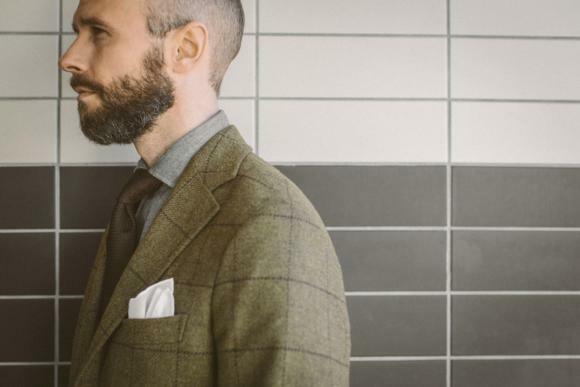 Steed and Formosa full bespoke (including pants) are less than $400 more. Did you manage to check the availability of the jacket & trouser cloth from the mills? Sorry, yes. The jacket cloth is exclusive to Drake’s for the next six months and is therefore not more widely available. However, they do have some for MTO, and potentially to refill any RTW gaps. The trousers I don’t have confirmation on, but that’s not an exclusive. Hopefully soon. Hi Simon and best wishes for the new year. 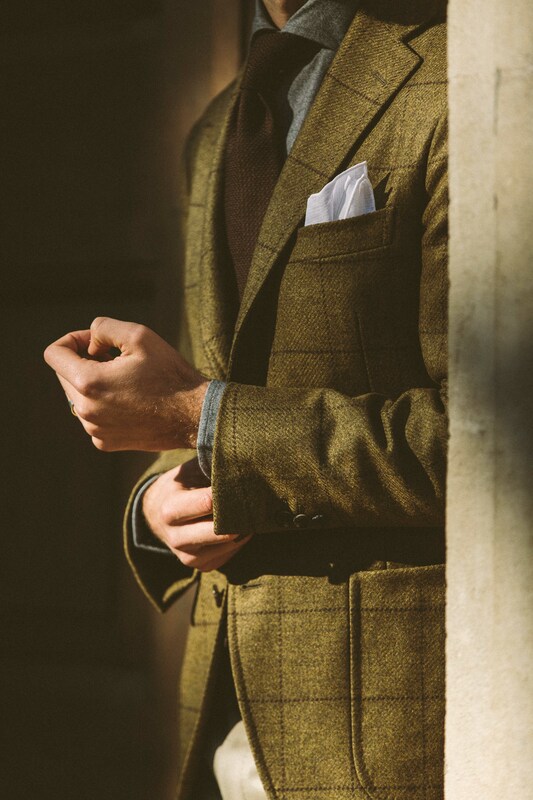 What do you think of the Drake’s Harris Tweed jackets in terms of make and style? Is it something you’d recommend for RTW? They have one in brown that brought your Caliendo to mind. Thank you. More generally would you wear a brown jacket like this paired with gray flannels for a casual Friday office environment? I usually wear formal suits and ties four days a week and either a suit without a tie or a navy blazer/smart trouser combination on Fridays. I am exploring other alternatives. I find many people in the office don’t even wear a jacket on Fridays but as a senior member of the team I prefer to dress more formally. Yes, that would be nice. Brown and green would always be more casual than navy or oatmeal, for example, but it sounds like brown would work nicely for you. Hi Simon, I’ve really enjoyed reading your articles. I’m a bit new to this world, so learning slowly bit by bit (which is the fun part!). 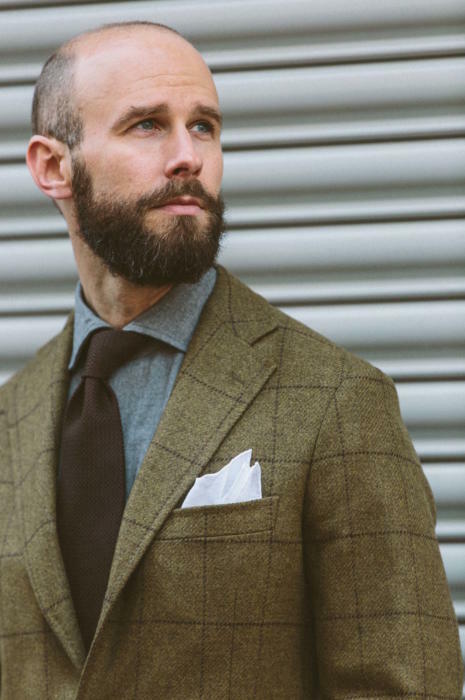 I actually picked up a ’18 RTW Drake’s tweed jacket recently, and was wondering if you could help breakdown some of its interior construction? Do you know if it uses canvas vs. fused, etc? You mentioned self-lining above, was wondering if you could expand at all in how that is created? Have enjoyed the jacket quite a bit to date, but just trying to learn as much as I can for my future investments. Thanks in advance for any shared knowledge. Cheers! That does sound fun. In a way I wish I were doing that all over again. I’m pretty sure that Drake’s jacket will have a full canvas (running right down the front) and it will be floating rather than fused. You can read about how to tell here. In terms of self lining, it just means the same material as the outside (the ‘self’) is sewn onto the front instead of regular lining. Some people like it as it feels like you’re wearing just the cloth itself, but it can stick a little more than a regular lining. Interesting outfit, it’s one of those looks that almost seems like it doesn’t quite work but is all the better for that fact. I think I would have gone a slightly different shade of trouser myself, maybe more a stone than a putty. What do you mean when you describe the jacket front as “self-lining” I haven’t come across this term and a quick google yields nothing! Simon – drakes no longer appear to be offering these online? Any ideas? Quick question, do you know which taylor does Drake’s use in Italy? It seems to be a Neapolitan from the cut. Thanks for your content (and your latest guides) which are really something of great value! How would you compare the quality of Drakes by Belvest and high end neapolitan RTW like Orazio Luciano, Attolini and Kiton. Less handiwork I guess? (I am looking at their current sale and they have some sport coats in tweed).